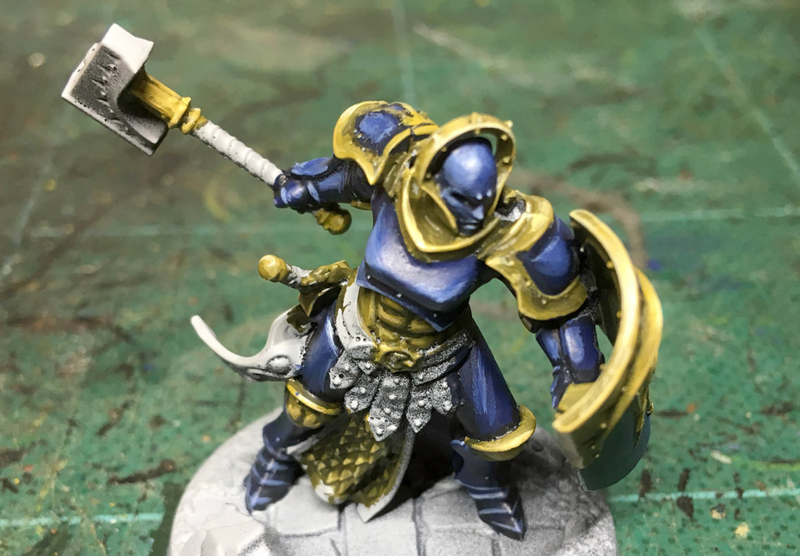 I continued working on the Angharad Brightshield model from my last post, pushing the contrast up a bit with deeper shadows (black and brown), and much brighter highlights. Same plan as before, only with more consistency across the model: the light source is coming across the body, from somewhere above the left arm. 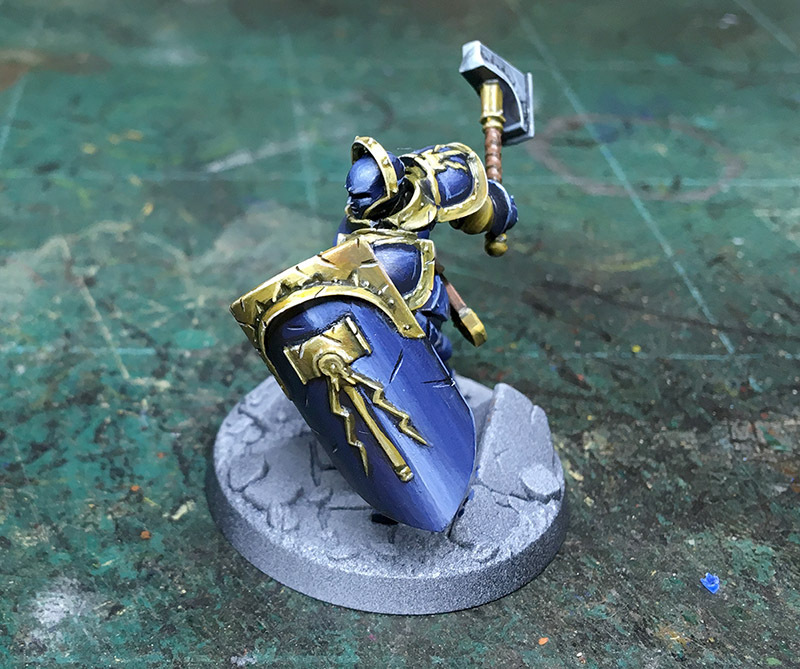 Now to open up the Shadespire box for another look at the game boards, and then I’ll try to match colours with the model bases. 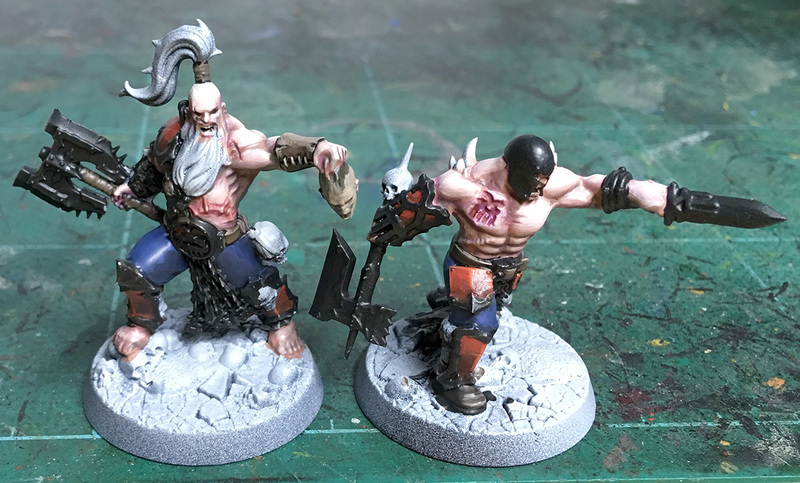 I had originally planned to work on 1-2 models from each warband before starting work on something new, but I’d like to have a painted Shadespire warband ready for a game. 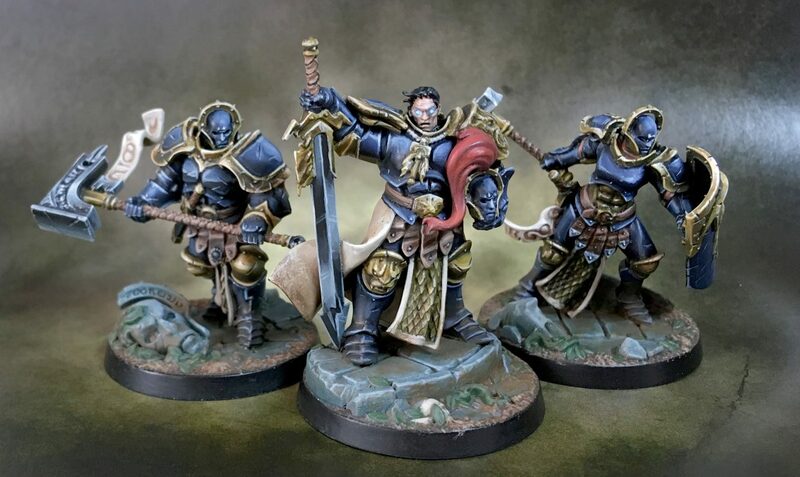 So, I’ve just cleared all the other models off my desk in preparation: the next things I paint will be the other two Liberators from Steelheart’s group. 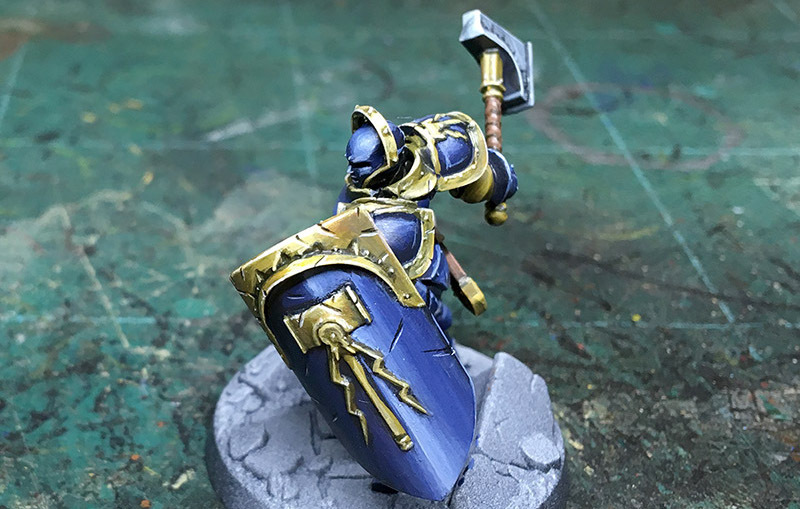 I’d planned to paint the Shadespire models in regular metallics, so I could quickly get them ready for some games. 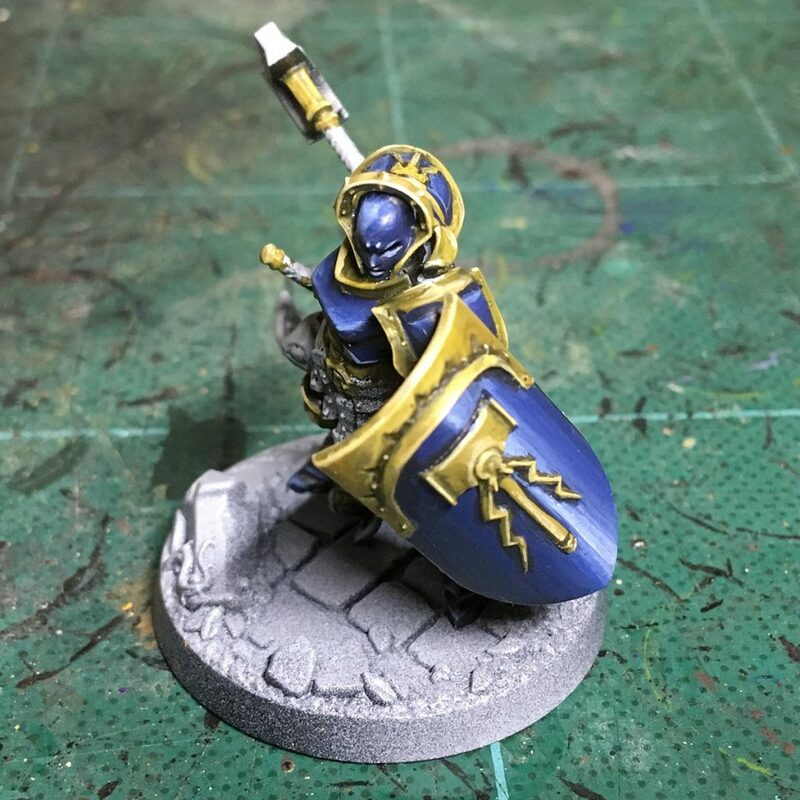 Then I realised that it’s pretty rare to have a painting project capped at only three models, and that seemed like a good opportunity to practice some non-metallic metals. 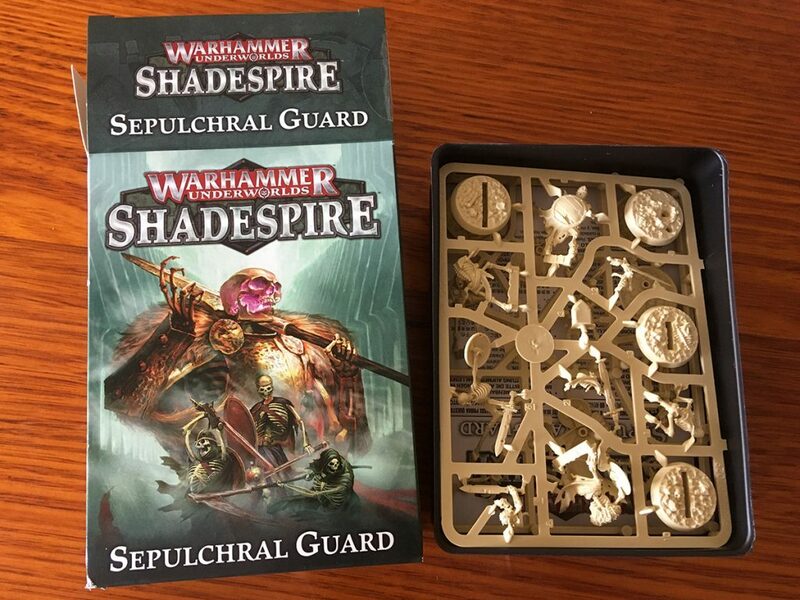 The Sepulchral Guard warband adds some interesting twists to the base game, and also contains some of the nicest plastic skeletons out there. 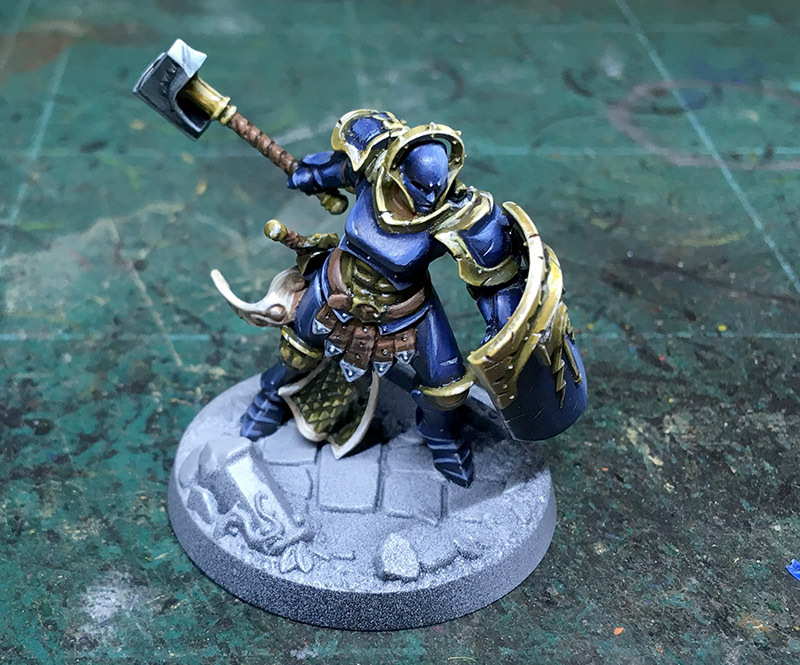 It’s a big warband, by Shadespire standards: seven models (1 leader, 3 heroes, and 3 lowly petitioners), able to swarm the enemy or cover multiple objectives with ease. 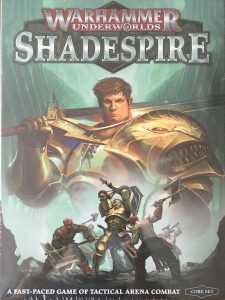 A Shadespire card list seemed like a handy resource to have, so I’ve added a list of every card I have so far. They’re presented here as two tables: one for Objective cards, and the other for Power cards. You can sort these lists directly in your browser – just click on the header to reorder the list. View the full tables below. 25 Feb 2018: new Spiteclaw’s Swarm cards. 14 Feb 2018: new cards from The Chosen Axes expansion. 10 Nov 2017: new Ironskull’s Boyz cards. 6 Nov 2017: new Sepulchral Guard cards. I’ve also started adding a category (Offence, Defence and Utility) to the Power Card list. 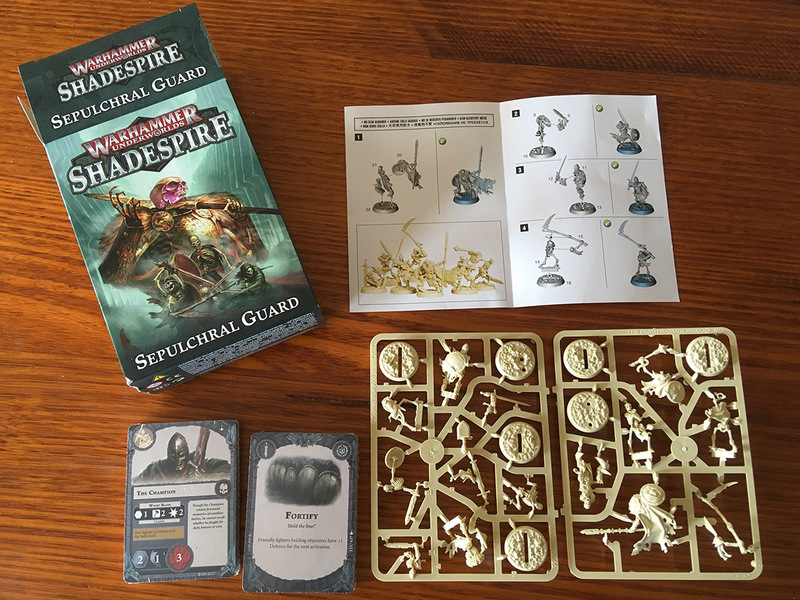 My copy of Shadespire arrived in the mail today, so I’ve opened it up for a quick look. No painting or gameplay time just yet, so these are just my first impressions of the box contents. It’s a nice compact box – around half the footprint of big-box titles like Warhammer Quest: Silver Tower, which seems about right for a game aimed at quick casual matches and easy portability. 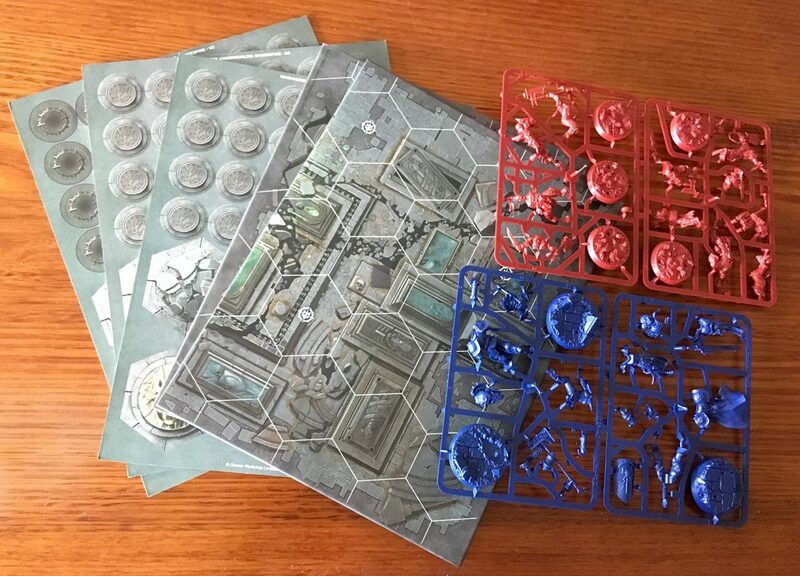 The box is pretty solid, but the card insert is not – mine arrived already torn, but I’ll probably add some foam inserts to carry the miniatures as soon as they get painted. 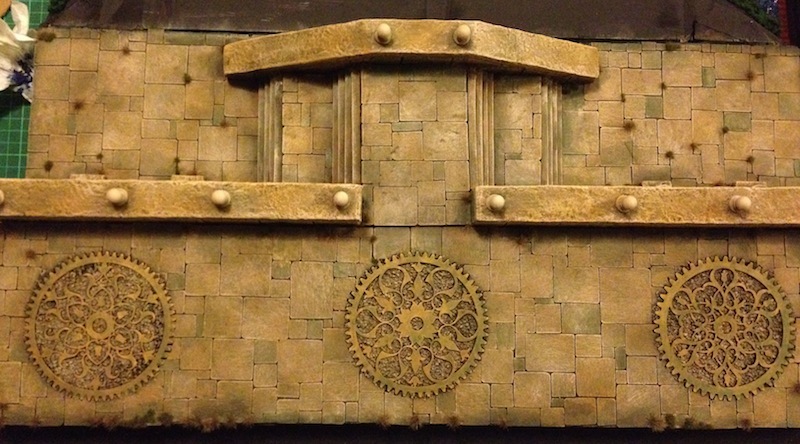 There are two double-sided boards inside: enough for a couple of options in gameplay, but I was hoping to find more after reading early convention reviews about how there would be “lots of board options” available. Still, they’re high quality card and artwork, and the hinged fold helps to keep the whole game compact. There are also three sheets of card tokens: wound markers, victory points, objectives and that sort of thing. 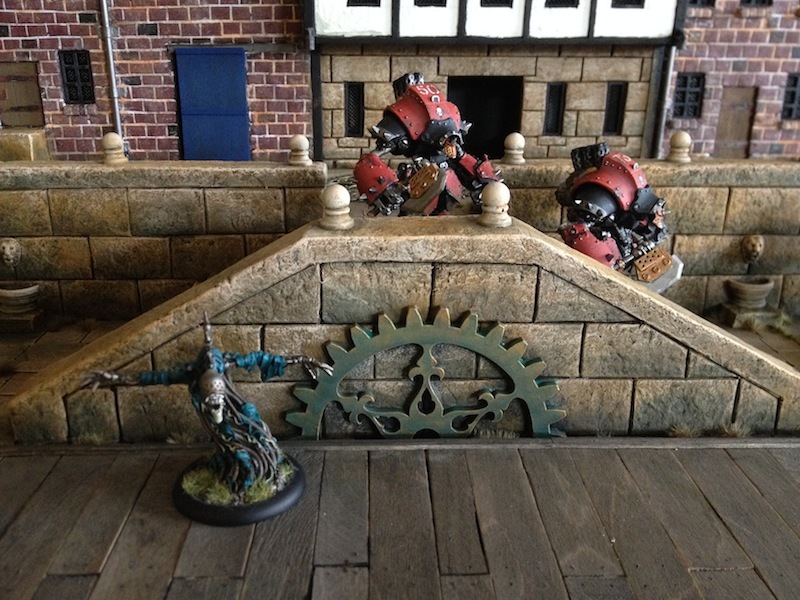 I started this blog with high hopes for porting across lots of the content I’ve previously worked on for painting and modelling diaries, starting with the River Dock project. That’s still my aim, but the PhotoBucket debacle has left me with hundreds of forum pages full of dead image links, and very little desire to wade through all the mess. However, I’ve just ordered a copy of GW’s new skirmish game Shadespire, and it’s dragging me back into this painting and gaming hobby all over again. 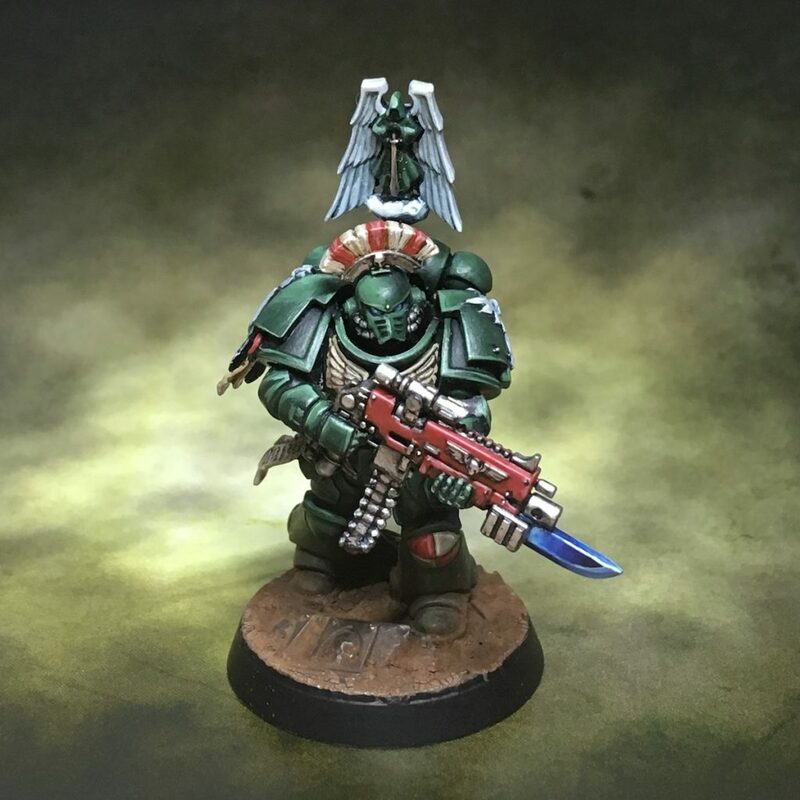 I like what I’ve seen so far, from the fixed lineup of each faction (paint one “set” and move on to something different), to the fast, tactical gameplay and the ability to vary tactics based on the objective and power cards chosen before each game.